This Celebrity-Approved Skincare Line Is Having a Major Sale Right Now! We’ve been led to believe that beauty is only skin deep. But what if we could tell you that we’ve been led to believe is not 100% truthful. Enter, Dr. Murad, who believes skincare is not superficial and created his skincare line with overall health in mind since beautiful skin equates to a healthy mind and body. In Hollywood, there is nothing more important than maintaining that beautiful, youthful glow. There is nothing, and we mean nothing, shoppers seek out more than star’ beauty regimens. An eye cream here or a moisturizer there, shoppers are led to believe that if they follow the same regimen, in turn, they too can have the same results. Unfortunately, the products celebrities often times use are unattainable for us average shoppers. So we were all pleasantly surprised when Emma Roberts recommended Murad a celebrity-favorite skincare line currently offering a great deal right now. 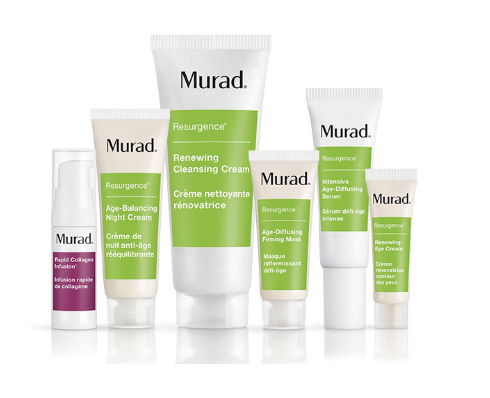 See It: Grab a Resurgence Anti-Aging Kit (a $104 value) for only $40 at Murad! Plus, score a FREE 5-piece Kit ($30 value) when you spend $125 or more at Murad using promo code “XOXO” through Feb. 14 while supplies last. Murad is offering a free five-piece kit (normally a $30 value) for shoppers who spend $125 or more at Murad! Simply shop using promo code “XOXO” while supplies last for a limited time whether a current user or a new shopper. For new shoppers looking to jump on the bandwagon for this already celebrity-favorite skincare line, look no further! Dr. Murad’s Resurgence line was developed for the shopper looking for that eternally youthful, Hollywood skin. Since our bodies’ ability to produce collagen decreases with age, as a result, the skin begins to wrinkle. Fear no more. The Resurgence line was specifically designed to combat the impact of the aging and in exchange provide an end result of firmer, more youthful skin. Looking to tackle all the big skin issues at once? No problem! The Resurgence Anti-Aging Kit is the perfect solution. Dr. Murad specifically tailored skin care regimen works together to reduce the appearance of medium to deep wrinkles while naturally improves elasticity, inhibits degeneration of collagen and delivers essential moisture to plump and reduce sagging. The regimen includes three main products and includes three bonus items. Talk about the gift that keeps on giving! The Resurgence Anti-Aging kit includes the Renewing Cleansing Cream, Intensive Age-Diffusing Serum, Age-Balancing Night Cream, Renewing Eye Cream, Age-Diffusing Firming Mask and Rapid Collagen Infusion. Shoppers will love that all products are interchangeable and can be used as standalone are all at once. Wow, we love! Too much, too soon? Relax, reviewers also recommend testing the products out one at a time. The Retinol Youth Renewal Serum is a fan-favorite. The retinol’s breakthrough serum, developed by Retinol Tri-Active Technology: a fast-acting retinoid time-released retinol, and a retinol booster. Resulting in a potent yet gentle formula quickly and visibly minimizes lines and deep wrinkles, firms, evens skin tone and boosts radiance for more vibrant, youthful-looking skin. Reviewers swear the results were almost instantaneously! Another fan-favorite is the Resurgence Renewing Eye Cream. This multi-active, anti-aging treatment for the eye area firms, brightens and hydrates to minimize the appearance of aging and dark circles. Palmitoyl Pentapeptide-4 reduces medium-to-deep crow’s feet and the Eye Brightening Complex diminishes puffiness for a brighter, illuminated eye area. It’s absolutely perfect for the shopper looking to minimize dark circles, reduce puffiness, and reduce crow’s feet. Murad skincare is the revolutionary skincare line created by the Murad Family in 1989. 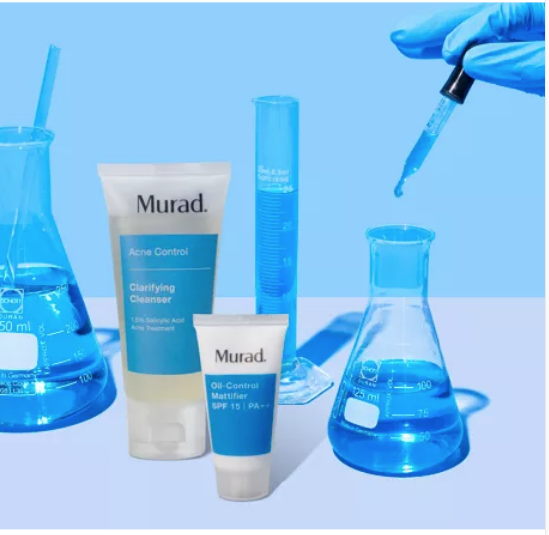 Since its arrival on the skincare scene, Murad prides itself in its groundbreaking formulas, which were among the first to achieve significant measurable anti-aging results without surgery. Can we say amazing! Dr. Murad prides himself in his innovative research and holds 18 patents for advances in the science of skin health. And rightfully so! Drawing the celebrity likings of Rachel Zoe, Kerry Washington, and Emily Blunt — Murad is the skincare secret to the stars. Most recently, Emma Roberts credited Murad’s Skin Perfecting Lotion as the reason to her ever-so-fresh-face. Roberts credits the lotion not only hydrating but calming her face without clogging pores. Which as shoppers, we know is no easy thing! For shoppers less familiar with the brand, the skin perfecting lotion is an ultra-light, oil-free moisturizer that helps blemish-prone skin stay smooth and healthy while hydrating and reducing the appearance of pores, refine texture and soothe redness. Truthfully, we can’t help but love how this product lives up to the hype! See It: Grab a Resurgence Anti-Aging Kit (a $104 value) for only $40 at Murad! Plus, score a FREE 5-piece Kit ($30 value) when you spend $125 or more at Murad using promo code “XOXO” through Feb. 14 while supplies last. See even more great skincare options at Murad!